Choosing the correct fish tank is something only you can do. You need to take into account the style you are looking for, the space you have for it, and finally the size that is right for the type and amount of fish you would like to have. Aquariums are also made in different shapes and materials but they all have the same basic characteristics and needs. Once you have chosen those, this Fish Tank Setup Guide is here to help you with everything you need to get your new tank or aquarium setup and running. With some planning and regular cleaning and maintenance, it’s not hard to keep your little friends alive and healthy. No matter what aquarium size you choose always be mindful that decorations and plants will take up some space. The bigger the fish tank the more fish, aquarium plants, and decorations you can have. Also, different fish species have different space and water requirements, as well as leave behind different amounts of waste and garbage requiring more of less cleaning on your part. Definitely do research on the type of fish you think you want, and then choose an aquarium size that will keep them happy, healthy, and stress free. Gravel should be good enough to allow the flow of the water through it and smooth enough to encourage nitrifying and other useful types of bacteria. Coarse sands, gravel, and marbles and stones are the most common choices. There are some materials that should be avoided due to their harmful effect on the aquarium residents, specifically calcium and limestone substrates. 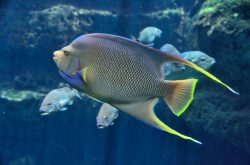 The filter is a very important part of the aquarium. The filter needs to have a flow rate that is powerful enough to turn over your tank 3-5 times per hour. What that means is on average the turnover should be 4 times the size of your tank. As an example, if you have a 5 gallon aquarium your filters gallon per hour (GPH) rate should be 20, and your 20 gallon tank should be 80 GPH. There are different options for types of filters including power filters that hang off the side or back, submersible filters, and undergravel filters. Marineland , Aqueon, Tetra, and Lee’s are all really good brands. They have adjustable flow rates, are simple to use, durable, and easy to clean and maintain. You will definitely need replacement filters sooner rather than later. In the first few months of your aquarium, they will be replaced more often. They are easy to replace and some filters are cleanable to extended use. Heaters are very important accessories to fish tanks. They are needed for tropical fish tanks, freshwater fish tanks, saltwater fish tanks, and betta fish tanks. You might ask why saltwater tanks will need a heater. There are two varieties of saltwater fish, one that needs warm water and the other cold water. Heaters help to keep your fish healthy and also help to prevent diseases. Some heaters are designed to keep the water at a specific temperature, but we recommend getting one that is adjustable. It will allow you to adjust the water temperature in any situation that might require it. There are many great brands of heaters. It is also very important to calculate the required wattage of the heater. The rule of thumb is 3 to 5 watts of heat per gallon of water. For a 5 gallon tank it will require a minimum of 20 to 25 watts. We do recommend getting one slightly higher rated than your tank as it will need more power during the winter months depending on the ambient temperature in your home. If you decide to have a cold saltwater aquarium, the required temperature for them is between 50 and 60 degrees Fahrenheit (10-16 degrees Celsius) and will require an aquarium chiller to keep it at that temperature. A good quality test kit is a nice to have accessory, but is not required. If you use an all in one water conditioner the kit can probably be skipped, however if you would like to make sure your new investment has a safe environment to live in it’s a good idea to get one. It will give you the opportunity to test the water before introducing new friends. A kit will allow you to test for ammonia, PH, nitrite, and nitrates, and you can get both freshwater aquarium and saltwater aquarium test kits. Feeding your fish the right food is a crucial and key part of their health. They should be fed in at least twice a day but we recommend three times a day. Food can be purchased in bulk that will provide the best value. We recommend using a combination of foods to feed fish at the different levels of your aquarium, top feeders, mid feeders, and bottom feeders, which will alleviate headaches for you knowing that each level gets food to eat. Many of the food options include color-enhancing properties to bring out the natural color and beauty. We have guides to help you find the best fish food for your community. Those guides include the best freshwater fish food guide, the best saltwater fish food guide, the best betta food guide, and if you are specifically looking for pond, koi, or goldfish food, we have that too. An aquarium vacuum will clean waste and debris from the various types of substrate (sand, gravel, etc.) you might have. This process will help lower the level of some nitrates. If you decide to include crustaceans in your tank, less vacuuming will be required as they help to clean debris and microorganisms. There are many good brands, but we recommend Terapump or Python. Fish nets are quite useful for removing dead and harmful plant matter, excess food and for moving your fish. For cleaning the internal glass or acrylic, an aquarium glass scrubber is very handy. You can have either or both real or fake plants for your community, however we always recommend going with real if you can. If you have a betta, fake plants should be avoided unless they are made specifically for bettas as others can damage their delicate fins. 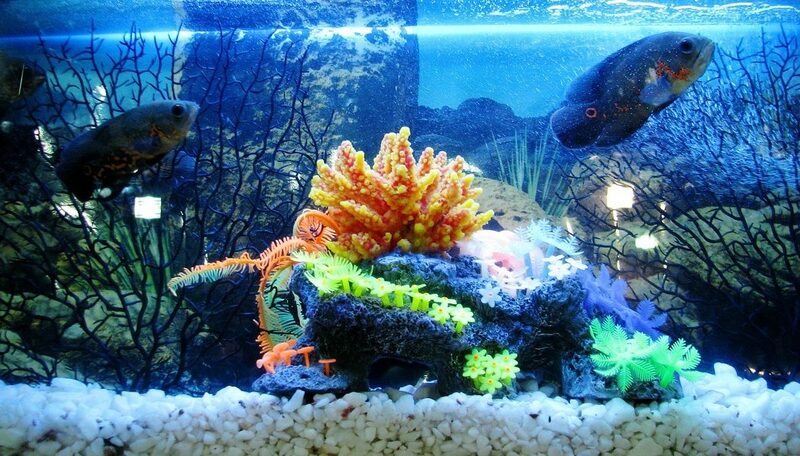 There are many decorations for you to choose that will allow you to decorate the tank to your personal taste and style. Never underestimate the weight of a full aquarium! Make sure that the stand or furniture you use is either rated for the size or can handle the weight of your tank, or be very sturdy if you choose to custom build one. Also ensure that the edges of the aquarium are not hanging over the sides. Some tanks come with stands but the majority do not. Decide where the aquarium and stand will be placed. You’ll need to put it in a spot where the temperature remains relatively consistent. Allow 5 inches (12.7 cm) between the aquarium and the wall to make space for your filter, if external. Keep out of direct sunlight as it will cause excess algae growth and require more cleaning. Try not to place the aquarium directly under vents as it will blow out and drop into dirt into the aquarium. It might also make it harder to maintain optimum temperature depending on the power of your air conditioning unit. Always try putting it near an outlet or using an extension cord, and it’s a good idea to use a surge protector power strip. Another thing to consider is how far away from a water source it is, as you should be changing 10% to 20% of the water each week. Lastly, if you have expensive rugs or carpets you might be better putting it somewhere else or buying a mat incase of spills. As mentioned previously, there are a few different types of filters including power filters that hang off the side or back, submersible internal filters, and undergravel filters. If you choose to go with an undergravel filter, make sure you get the correct size and install it prior to adding gravel to the tank. Keep in mind that you can’t use an under gravel filter if you want to have sand or other fine substrates. If you choose to go with a power or submersible filter you need to ensure it is rated the the size of your aquarium. As mentioned previously, the filter needs to have a flow rate that is powerful enough to turn over your tank 3-5 times per hour. As example a 10 gallon tank would need a filter that has a minimum flow rate of 40 GPH. The installation methods vary by filter and it’s best to follow each filters own instructions. Don’t turn the filter on until the aquarium is filled with water, as you do not want to pump to run dry. When you replace 10% to 20% of the water each week, we recommend turning off the filter in case the water gets below the filer intake level. Gravel comes in a variety of different sizes and colors giving you many options on how to setup the look of your tank. Sand is suitable for fish and invertebrates that like to burrow but it should to be stirred on a weekly basis to prevent dead spots that can cause problems with your tank and filter. Gravel is recommended for someone new to the hobby. Having about 2 to 3 inches (5.1 to 7.6 cm) of gravel on the bottom is a good target. Rinse the substrate in water that is clean before adding it to the tank. The less dust in it, the faster it’ll clear when the tank filter is started up. This step is very important if you’re using sand but should be done for all setups. Never soap, as it is toxic for your fish. Spread the rinsed gravel in an even layer. You can put a plate on top of the substrate before you add the water to stop it moving around and shifting too much. The decorations you choose and their positioning and location is a personal preference. It’s best to setup the decorations prior to adding the fish, but might require some changes once you add water if they shift or don’t sit right. The decorations you can choose from are almost endless. When choosing plants, you want to ensure they are compatible with the type of fish species you plan to get. The types to look at include tropical aquarium plants, freshwater aquarium plants, and saltwater aquarium plants. Some plants will need the roots submerged while others will either sink and sit atop the gravel or float. We always recommend getting live plants as they provide many benefits to the fish, crustaceans, and the water. It’s also good to have some crustaceans as they will help keep the plants cleans and stop algae from taking over. Shrimp, snails, frogs, crabs, and lobsters are good options depending on the type of aquarium you choose. Always check compatibility before adding anything new to the community. If you have not done so already, install your heater on the inside of the aquarium or in the filter cavity. The heater will usually attach with suction cups and if there is a minimum submerge line, make sure water will be above it. Positioning the heater near the pump or filter will help to ensure the warm water is spread around evenly. As mentioned earlier, we recommend an adjustable heater. A good rule of thumb is 3-5 watts of heat per gallon of water. Most fish like it between 70 and 80 degrees Fahrenheit. However, we recommend keeping it between 78 and 82 degrees Fahrenheit (25-28 degrees Celsius) in all tropical fish, freshwater fish, or warm saltwater fish communities. If you have a cold saltwater aquarium that will require a temperature between 50 and 60 degrees Fahrenheit (10-16 degrees Celsius) and will need an aquarium chiller to keep it at that temperature. It will be used similar to a heater but will keep the water at a colder temperature, depending on your room’s ambient temperature. Regardless of whether you have a heater or chiller, do not turn it on until water has been added and give the water time to adjust before adding your fish. When you plan to add the water, it’s best to condition with water conditioner prior to adding it to the tank. Follow the directions on the bottle and condition a half to one gallon at a time. If you choose, you can also add a dose of SafeStart or another catalyst for natural bacteria that help speed up the growth of good microbes. If you choose to go with a saltwater community you will need to get aquarium sea salt. Adding this per the instructions is critical. You want to target a specific gravity of 1.020 to 1.025. The amount of salt required to reach that specific gravity is based upon the amount of water in your tank. Follow the package directions and you should have no problems. As long as you add the water conditioner to your water prior to adding it to the tank, you won’t need to worry about the filter removing the chemicals before they take affect. If you choose to, you can cycle your aquarium water for a few days prior to adding your fish to ensure the water has the right chemical properties. If you have particularly high amounts of nitrites and ammonia, you can use an ammonia remover. Water changes help to remove nitrates if they are high as well. Continue checking the water for the first few days and weeks to make sure it stays in balance after adding your fish. Fill the aquarium with a few inches of water and watch for any leaks. If you don’t see any leaks continue slowly filling the aquarium and checking for leaks after each half or gallon water addition. Fill it up to just under the rim leaving a small gap of around 1 inch (2.5 cm) from the top. If you have a betta, they can jump high so it’s best to leave it a couple of inches from the top, depending if your tank allows you to do that without the water getting below the filter level. You can read more about betta fish care in our guide. Decorations and plants may have shifted so you should go ahead and fix anything before adding your fish. You can now turn on or plug in the filter and pump. Water should, without noise or problems, start circulating, however you might not be able to visibly see this depending on the filter or speed setting. If you have an undergravel filter, water will start moving vertically in the lift tubes. This will also be the best time to turn on the heater or chiller to start getting the water to the correct temperature. Be patient and wait an hour or two before adding fish to make sure there are no problems. When choosing fish, you can go to a local pet or fish store, or shop online. Stores will usually have compatibility information as well as behavioral knowledge about the different types they have to offer. Some can be more aggressive than others, so ensuring the compatibility in your aquarium community is very important. Betta fish are great for first time fish owners, but they are aggressive and should be the only one in the tank, other than some snails and shrimp. Regardless of which or how many fish you choose, make sure they are all one type; tropical fish or freshwater fish, warm saltwater fish, or cold saltwater fish. Guppies, swordtails, platy fish, and molly fish are good freshwater or tropical options for a beginner. The size of your tank will dictate how many fish you should have. The rule of thump is 1 inch of fish per one gallon of water. There are always exceptions to the rule so start with less and add more as you go along if you want. Crustaceans are another great addition to every tank. They help keep it clean from microorganisms and contaminants. In saltwater aquariums you can have corals and other types of invertebrates. When you purchase your fish they will usually come in a closed clear plastic bag with some water in it. Before adding them to their new environment it is important to get them acclimated to it. Keep the bags closed and rinse the outside of them. Then let put the bags on top of the aquarium water and let them sit there for 30 minutes to an hour. This will allow the temperatures of the waters to come to equilibrium. Once the temperatures are equal it is time to add the fish to the tank. Use a fish net to take the them out of the bag and place them into the tank. Do not add any water from the bags into the aquarium, as you do not know how they were conditioned at the store. The store water can even have some unwanted things like a fungus or possibly parasites. You do not want to add any unwanted things to your new aquarium ecosystem. If you plan to add a large number of fish, introduce a few at a time and wait for them to acclimate. Adding too many at once you can make it harder for the filter to adjust and keep up with the new ecosystem. The water might not be able to cycle well and could cause issues. Be patient and you will be rewarded with an easy to manage situation. We hope this Fish Tank Setup Guide helped you get setup with everything you needed for your fish aquarium or fish tank. Whether this is your first time or you are just looking for a refresher, this guide should provide you with all the knowledge and steps you need. Please comment below letting us know if this helped you or if we missed anything. Thanks for reading and enjoy your new little friends. Thanks for the advice about choosing a heater/chiller with an adjustable temperature for my aquarium. I’ve never set up a saltwater aquarium before, but it seems to be a bit more complicated that the small freshwater ones I have owned in the past. Perhaps I could consult with an aquatic technician before I buy my supplies. I just want to be sure I’m not missing anything.